Sores that appear inside the mouth can also be referred to as canker sores and the condition is scientifically known as stomatitis. These sore usually vary in appearance and size and can affect different areas in the mouth including the tongue, cheeks, and gums, lips, under the tongue and on the roof of the mouth. The sores may appear with swelling and redness in the lining of the mouth with painful ulcers. If the sore appears to be white, it means they are covered with dead cells and food debris inside the center part. Some sores inside the mouth are usually raised and filled with fluid just like blisters. In most cases, the mouth looks normal even though affect persons have symptoms of inflammation or burning syndrome in the mouth. These noncancerous benign are usually painful until healing starts taking its course. This pain may make eating or talking a bit difficult, even warm foods and drinks may irritate a lot. Sores are usually not a cause for alarm as they can easily be treated and in some cases, they go away on their own after a short period of time. Sores that keeps own recurring after a short period of time should be addressed to the doctor. They may be a risk factor for a certain systematic illness and they may be caused by either a viral infection or a condition known as recurrent aphthous stomatitis. It is not clearly known exactly what causes canker sores or aphthous ulcers. However, there are many factors that are linked to the risk of getting them in the mouth. These factors may range from minor daily causes to serious illnesses. Stress and tissue injury are thought to be the reason behind simple mouth ulcers. In addition to that, some of the foods we eat may have a lot of acids that may irritate the thin tissue lining found in our mouth, causing the formation of mouth sores. We will share some of the common factors that may lead you to get sore in your mouth, although we cannot cover all the issues that can lead to an ulcer in the mouth. Knowing the reason behind your sore can help you when it comes to finding the right treatment to clear your sores. You may wonder how the mental condition can just lead to the development of mouth sores. Some sources ague that stress has an effect on the activities of hormones in the body. When the level of stress is high, this will increase hormonal activities and some of the effects of this change are the formation of sores in the mouth. Some research findings confirmed that people with stress were found to be complaining a lot about the formation of ulceration inside their mouth. You may be eating and accidentally bite your tongue or inner lip. Or you may be brushing your teeth aggressively and within no time you hurt your gums. Irritation that results to all these things is what we refer to as tissue injury. This is because they cause breakage on the thin skin found in the mouth. The wound formed may develop into a sore which is very painful with a burning sensation. This may take longer than a normal wound would take to heal. In most cases, the reason behind sore developing from a small fracture is because the inside mouth is always wet and warm meals access the mouth every time and then and therefore causing irritation to the small would which then develops into a sore. Some health conditions that hail in our body may reveal different types of symptoms. For example, HIV and cancer are known to be diseases that are associated with multiple symptoms and this may include the formation of sore in the mouth. You may experience numerous symptoms from such conditions because they weaken your immune system and make your body unable to fight small illnesses some of which may cause canker sores. Your nutrition deficiency can as well be the reason why you have recurrent ulceration in your mouth. Some nutritionists have explained that a deficiency in nutrients such as vitamin B-12, folic acid, or iron can make someone prone to sores inside the mouth. This is because these nutrients are very essential when it comes to faster healing of wounds and if you lack them this will means small cuts in the mouth can develop into much more complications such as a sore inside mouth. In that cases ensure you feed on a balanced diet that includes vegetables of every kind, fruits, foods rich in iron, whole grain and foods rich in folic acids. You can develop an allergy from the food you eat, drinks or even the new toothpaste that you started using. Some foods such as vegetables and citrus fruits are very rich in acid, which can irritate the thin skin inside your mouth. The irritation may lead to the development of cuts in the mouth which then become sores. Ingredients used to manufacture that toothpaste you are using may not be friendly to your inner mouth skin. This is usually experienced with a burning sensation in your mouth, bleeding and even itchiness. Change your toothpaste if it causing you wounds in the mouth. A strong immune system means that your body is able to protect itself from different types of infections including those that cause canker sores in the mouth. If you have an impaired immune system, mall issues such as cuts in the mouth become a problem to heal. This is because while it is just a cut, infection-causing organisms such as fungi, virus or bacteria may take advantage and try to infect the cut. Since the body can’t protect itself, the infection may proceed to other stages and now the wound will become red, itchy with irritation whenever you eat or talk. More sign of infection may include swollen lymph nodes under the lower jaw. Tobacco contains nicotine that usually causes gum recession, tooth abrasion and decaying of teeth. Constant chewing of tobacco may result in irritation to the gums and their lead to the development of sores. These types of sores are usually seen on the upper part of the gums. This is a common infection in the mouth caused by the fungal organism. Usually, fungi exist in the mouth in a harmless state in form of yeast. It may grow to cause an infection if conditions that cause its growth are present. This is usually visible in form of a sore inside mouth. These types of sore can appear anywhere in the mouth including the tongue, cheeks, lips and gums. Some medications are usually associated with some serious side effects. It is not surprising that you realize some ulceration in your mouth after undergoing a specific treatment. This is usually common with medications such as chemotherapy or radiation treatment for those people who have cancer. Minor ulcer- this are types of sores inside the mouth that are around 2-8mm in diameter and they are not there to stay for long. They may take less than two weeks to heal. This will only depend on if they are infected or not. 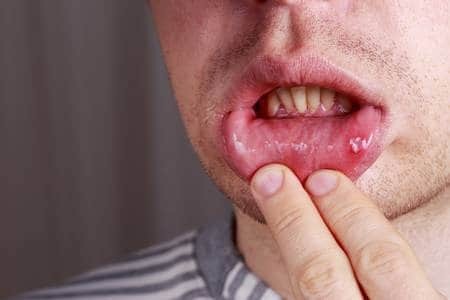 Major ulcers – these types of mouth ulcers are usually big and dip, and they may have a raised irregular border around them. In some cases, they may be covered with white patches or may just be red. They may take several weeks before they heal and they usually leave a scar inside your mouth. Herpetiform sores – this is a condition whereby you develop numerous or dozen of small sores in the mouth in most cases in the same area. Sores in the mouth can either be canker sores or cold sores. These are two different types of sores in the mouth. Usually, cold sores usually appear on the lips while canker sores form on any part of the inside mouth. Canker sores usually may not involve herpes virus and they are not contagious, while on the other hand, cold sores are contagious. Cold sores may first appear with a red, irritated skin, which may then result into formation of blisters that rapture, and then crust over before starting to heal. Sores usually appear on the soft tissues of any part of the mouth. They are common conditions that affect very many people at some point in their lives. They usually appear in different sizes and shapes depending on what caused them to occur. Some may be deeper and large while others small and shallow. It can be a single sore inside mouth or a dozen of them in the small area. You can have a look at our pictures that we have provided to find out which types of sores you are suffering from. Most sores may appear as single but in some cases, they can be numerous in a single area. In some cases, the area may tingle or burn a little bit before the formation of a sore. During the healing process, sores may be painful, usually during the first 3 to 4 days. Scarring may occur in case the sores were larger and deeper. Yes, canker sores heal without medication, but you may want to reduce the time taken for them to heal. Furthermore, the pain from the sore may be too much to bear. In this case, there are home remedies that can help to deal with all these symptoms associated with canker sores. Warm water with salt can be used to treat canker sores naturally. Salt can be used to kill infections that may have taken advantage of the wound and therefore clear off all the germs. You just need to warm some water and add in some small amount of salt to make up a solution. Then use the solution to swish in the mouth and spit out. Do this at least twice every day for better results. While you carry out your normal dental hygiene process, make sure not to damage your gums as the wound that will result may develop into the canker sore. Use a soft toothbrush as well if you have a canker sore as it can help to avoid irritating the sore. Maintaining good oral hygiene may help to prevent the sore from getting infected. Lemon juice is an anti-bacterial and anti-fungal agent and therefore can help to kill any germs that may have caused an infection or sore inside mouth. You just have to extract lemon juice and apply it directly on the sore. This may not be a walk in the pack as lemon is very painful when applied to a wound. People who are more allergic may add some water to it so that they can reduce the acidity level. This combination has been used for various treatments and it has been proved to help in the curing of canker sores by reducing pain and inflammation. Honey has antiseptic properties and can be applied directly on the sores. On the other hand, chamomile may act as an anti-inflammatory agent. You just have to drink a strong chamomile tea and use it to rinse the mouth. Some foods may be causing you sores due to allergic reactions. therefore, if you realize a certain food brings you problems such as making your mouth sores condition worse, avoid eating that food. On the other hand, make sure the toothpaste you use doesn’t cause you allergy. Usually, no tests are done in this case because your doctor can just identify canker sores by physically examining them. He/ she may just ask a few questions based on your medical history or that of your child alone. If the canker sores are severe (larger and deeper, or keeps recurring) your doctor may want to carry out some tests to find out if it is nutrients deficiency that causes them to appear. If so, dietary changes may be advised or you may be prescribed to take some vitamin supplements. This may also be done in case of an impaired immune system. Just because sores that occur inside the mouth are common, it doesn’t mean they should be ignored. Some sores could be a symptom to a serious disease especially if they recur after a very short period of time. When they appear in children, they can cause serious problems with their feeding. If your child has a sore that lasts for more than two weeks, talk to your doctor about it asap! In most cases, mouth sores usually heal without medical intervention after finishing their course which is normally less than two weeks. In case they are painful, ibuprofen or acetaminophen may help to relieve the pain they pose on your child. Topical medications or oral mouthwash may be prescribed by the dentist for sores that don’t go away after two weeks or keeps recurring after some time. For medicines that are applied directly to the sore, you have to first blot the area dry before applying the medication. You may then use a cotton ball to apply a small amount of medicine to the sore inside mouth. Don’t drink water or anything especially warm for about 30 minutes to allow medicine time to take action.